The Advanced Plant Habitat (APH), a recent addition to the International Space Station, is the largest growth chamber aboard the orbiting laboratory. Roughly the size of a mini-fridge, the habitat is designed to test which growth conditions plants prefer in space and provides specimens a larger root and shoot area. This space in turn will allow a wider variety of crops to grow aboard the station. Thus far, the habitat has been used to grow and study Arabidopsis, small flowering plants related to cabbage and mustard, and Dwarf Wheat. Its monitoring and environmental control systems regulate temperature, oxygen, and carbon dioxide levels, and the system settings can be adjusted for growing different types of plants. Although the system is largely autonomous, the crew adds water to the chamber and changes atmospheric elements such as an ethylene scrubber, carbon dioxide scrubber & bottles, and filters. All systems can be monitored and controlled from a computer on the ground that interfaces directly with the habitat to relay instructions and detailed adjustments to ensure investigation integrity. 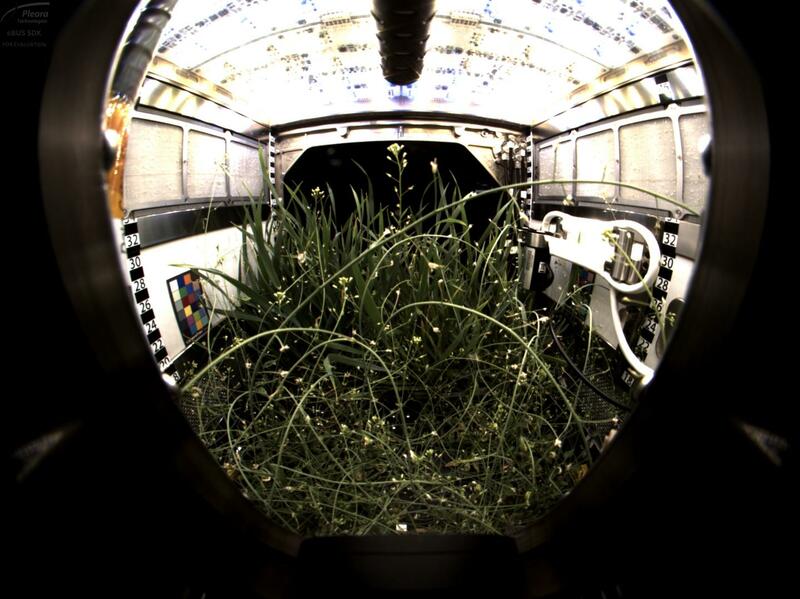 Because gravity is a constant downward force on Earth, researchers take advantage of the microgravity environment of the space station to achieve a clearer perspective of plant growth habits. Gravity is one of the major cues plants use to guide their growth, but microgravity can act as a kind of mute button that suppresses the role of gravity, enabling researchers to see what other cues take charge. The APH also has an upgraded LED system that goes beyond the red, blue and green LEDs used at low, medium and high settings in the Veggie plant habitat. APH is equipped with white, red, blue, green, and far red LEDs and has a wide variety of settings capable of producing light from zero to 1,000 micromoles, a unit of measurement used to describe the intensity of a light source. By expanding the spectrum of light, researchers can broaden the types of plants they study in space and tailor the light to that plant's unique needs because each of the lights within APH can be set to any level within that range. "It's more of a fine-tuned instrument," said project manager Bryan Onate. If a team wants a certain amount of light for an investigation, we can provide that." Humidity and temperature can also be manipulated to test plant threshold responses for both ideal and inhospitable growth environments. APH also provides the first true foray into studies involving space-based agricultural cycles. "Not only can we grow small plants, but we will be able to grow seed to seed" said Onate. This means that an entire line of plants could be grow from one seed brought from Earth, creating generations of offspring destined for life among the stars. "If we can get seeds that are viable in space and grow multiple generations from that one seed, that's a new capability. And we now have the space to do that kind of testing with APH. We've tried to create a little Mother Earth," adds Onate. Alongside investigations like Veggie-PONDS and Plant Gravity Perception, this new facility sets the stage for a world of growth in space but also holds lessons for intervention gardening here on Earth. In learning more about the conditions plants prefer, botanists here at home may be able to plan new growth strategies for drought and blighted regions or push for the adoption of large-scale automated growth systems in regions with no naturally-arable soil. The APH supports research solicited through NASA Research Announcements (NRAs) that are designed to meet NASA's goals for the successful completion of exploration missions and the preservation of astronaut health throughout the life of the astronaut. In addition, the facility is available to support commercial and academic U.S. National Laboratory investigations sponsored by the Center for the Advancement of Science in Space.